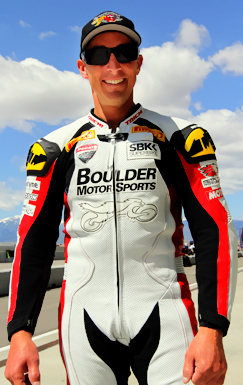 Motorcycle racer Shane Turpin raced as a wild-card in World Superbike at Miller Motorsports Park, rode as an invited rider at the World-renowned Cadwell Park circuit in the 848 Challenge series and won four national championships with CCS at Daytona, not just in his career but in 2012 at the age of 44! Shane is well-known in the industry as a rider who not only gets around a track very quickly but understands the how's & why's of what makes it work. Shane has been sharing that knowledge with other riders, first as an instructor with the Freddie Spencer High Performance Riding School, later with the Yamaha Champions Motorcycle Riding School (where he remains on staff) and now is available for coaching with you or your group (up to six riders) at the track location of your choice. The Shane Turpin Riding Experience will combine classroom time with track sessions that will utilize on-board video and bike-to-bike communication to assist you in becoming a faster, better, safer rider. Assistance with bike setup will also be included. The calendar below will show the scheduled dates as they become booked.